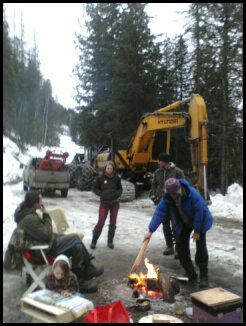 A warm fire greeted the logging companies this morning as they attempted again to access Sinixt Territory with the purpose of logging. 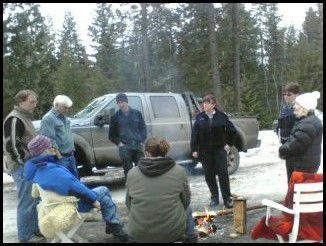 After the crew was informed that they did not have the permission of the appointed spokesperson of the Sinixt Nation, Marilyn James, the logging crew proceeded to call the RCMP for guidance. 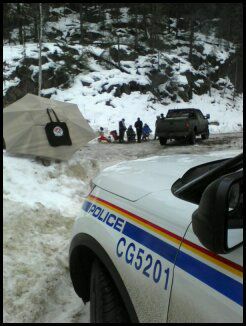 The RCMP spent a few hours at the camp gathering information in order to approach the courts for an injunction and informed the camp that they will be back. 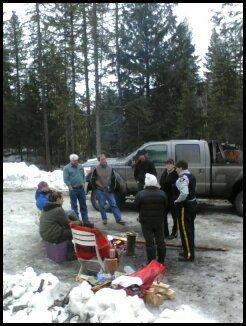 The last stand taken by the Sinixt on Perry's Ridge saw the courts deny the RCMP an injunction order. Coffee and laughter around a fire as more road building machines are brought down the mountain. 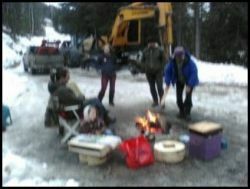 A great way to start the day!